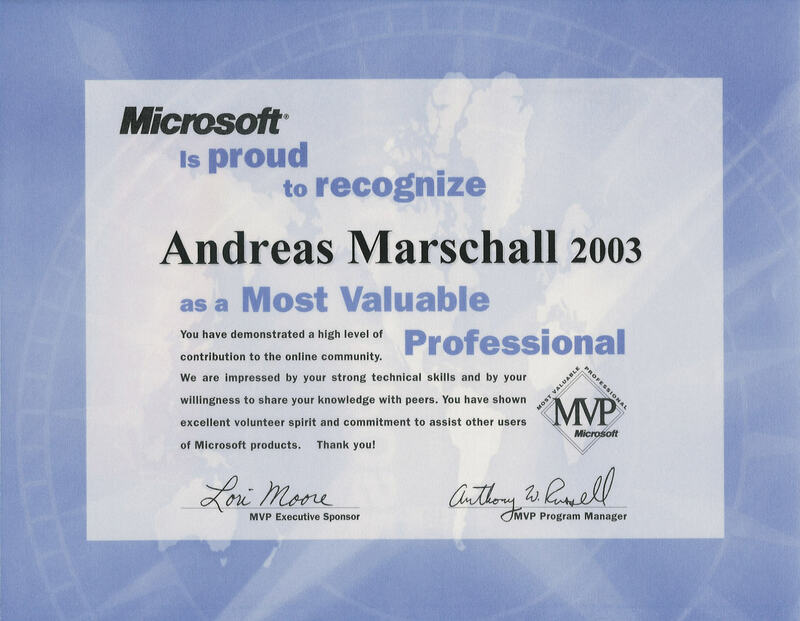 Andreas Marschall is a TAPI / TSP Developer and Tester since 1997. 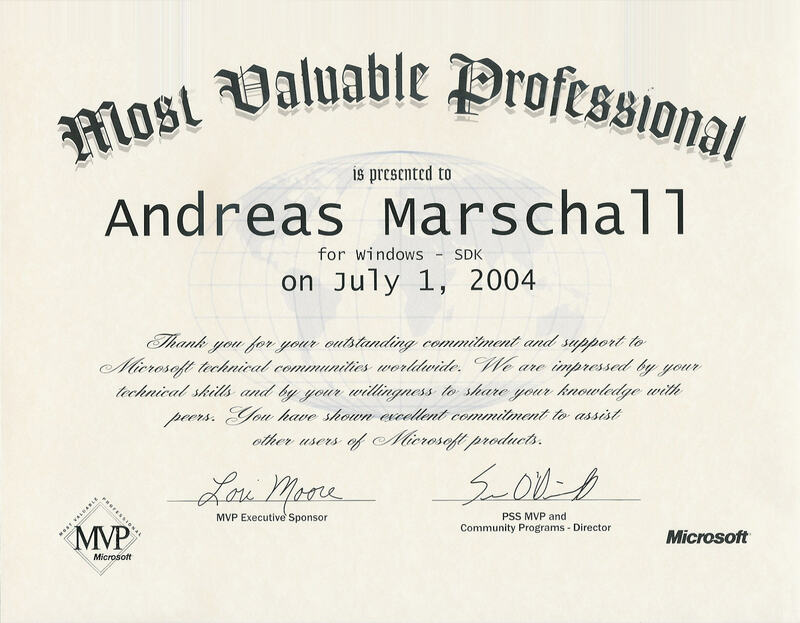 His contribution to the TAPI newsgroups has been recognized by Microsoft® with MVP Awards for TAPI / Windows® SDK in 2003, 2004, 2005, and 2006. 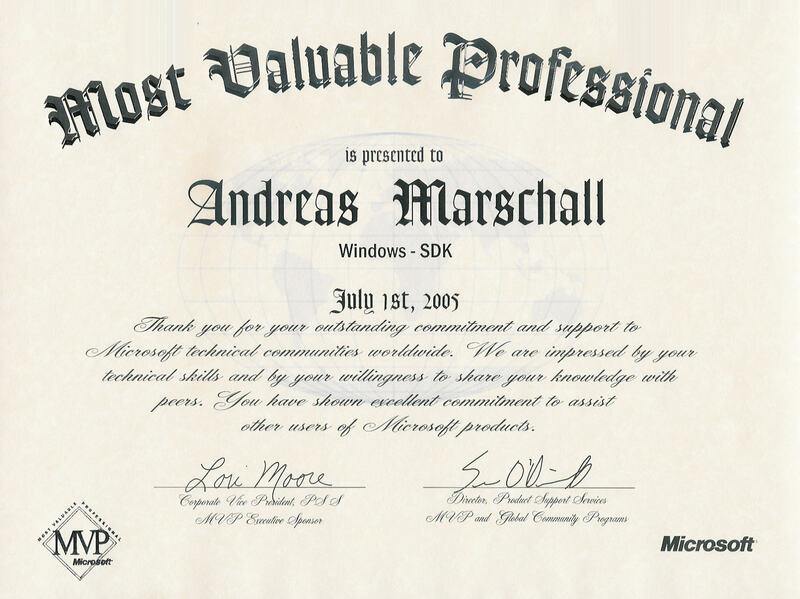 He received the Microsoft® 2004 Windows MVP ‘Winny’ Award in the category ‘Developer’ at the 2004 MVP Global Summit in Redmond / Seattle, WA, USA. See his MVP Profile (incl. Biography Abstract, Publications, Conferences, etc.). He attended the last TAPI Bake-Off in Nice, France, in July 2000. Feed for Update Notifications available. Copyright © 2004-2006 by I-B-A-M®. All rights reserved. All opinions expressed on this page are my own. This page is provided "AS IS" with no warranties, and confers no rights. Microsoft, MSDN, Visual Basic, Visual Studio, Windows NT and Windows are either registered trademarks or trademarks of Microsoft Corporation in the United States and/or other countries. Other product or company names mentioned on this page may be the trademarks of their respective owners. See also the Additional legal disclaimer in German language. All Toto® Tools are © Copyright by Andreas Marschall, I-B-A-M®. All rights reserved not expressly granted to you in this EULA. The Toto® Tools are protected by copyright and other intellectual property laws and treaties. Andreas Marschall, I-B-A-M® owns the title, copyright, and other intellectual property rights in the Toto® Tools. The Software is licensed, not sold. You may install, use, access, display and run as many copies of any Toto® Tool on as many of your computers you choose. You may not reverse engineer, decompile, or disassemble any Toto® Tool. You may not rent, lease, lend or sell any Toto® Tool. You may not re-distribute any Toto® Tool executable in any form without written permission from the author. You may not distribute a direct link to any binary / ZIP file of any Toto® Tool executable in any form without written permission from the author. You may only distribute links to this web site and parts of it that link to the top of the page or to the beginning of a section listed in the table of contents. The Toto® Tools on this page are provided "AS IS" with no warranties, and confer no rights. There is no liability for damages, direct or consequential, which may result from the use of any Toto® Tool. With the download or usage of any Toto® Tool you are accepting the complete Toto® Tools Collection EULA. Q: How can I stop TAPISRV process (if Telephony Service is not responding in Service Control Manager) ? Toto CYCLERUN is a tool to run a given program periodically for a given time. enclose the parameter in ""
- specify the full path and file name and extension of the program. but uses the current drive and current directory. Close this CMD window to stop CYCLERUN. Toto® Tool CycleRun monitors the created process. If this process terminates not before timer run_time elapses then CycleRun terminates the process and starts the timer cycle_time. Otherwise, if this process terminates (e.g. by user action) before timer run_time elapses then CycleRun either waits until timer run_time elapses before starting the timer cycle_time (default option wait) or it will not wait until timer run_time elapses but starts the timer cycle_time (option nowait) immediately. Toto KillProcessName is a tool to terminate a given process periodically. Toto® Tool KillProcessName can be used for instance to “block” unwanted popup programms by automatically detecting and terminating them. If you specify a very small Scan_Intervall or even 0 (no Sleep) then you will encounter a significant increase of CPU usage. Toto® Tool IncrementalOpenWebPage requires the Microsoft® .NET Framework version 1.1 (or higher). TAPI2 error code: 0x80000000 (dwMessageID = 0x0000e000) = The operation completed successfully. TAPI3 error code: 0x80040001 = The buffer passed in to this method was not big enough. TAPI3 error code: 0x80040002 = No items exist that match the request. TAPI3 error code: 0x80040003 = This method is not supported. TAPI3 error code: 0x80040004 = The MEDIATYPE passed in to this method was invalid. TAPI3 error code: 0x80040005 = The operation failed for an unspecified reason. TAPI3 error code: 0x80040006 = The device is already in use. TAPI3 error code: 0x80040007 = No call appearance available. TAPI3 error code: 0x80040008 = Too many call completions outstanding. TAPI3 error code: 0x80040009 = The conference is full. TAPI3 error code: 0x8004000a = The dial modifier is not supported. TAPI3 error code: 0x8004000b = The device is already in use. TAPI3 error code: 0x8004000c = The phone number is invalid or not properly formatted. TAPI3 error code: 0x8004000d = Operation not permitted in current address state. TAPI3 error code: 0x8004000e = Invalid LINECALLPARAMS structure. TAPI3 error code: 0x8004000f = Invalid call privilege. TAPI3 error code: 0x80040010 = Operation not permitted in current call state. TAPI3 error code: 0x80040011 = Invalid calling card. TAPI3 error code: 0x80040012 = Invalid call completion ID. TAPI3 error code: 0x80040013 = Invalid country code. TAPI3 error code: 0x80040016 = Invalid digits. TAPI3 error code: 0x80040017 = Invalid group pickup ID. TAPI3 error code: 0x80040018 = Invalid location ID. TAPI3 error code: 0x80040019 = Invalid message ID. TAPI3 error code: 0x8004001a = Invalid park ID. TAPI3 error code: 0x8004001b = Invalid rate. TAPI3 error code: 0x8004001c = Invalid timeout value. TAPI3 error code: 0x8004001d = Invalid tone. TAPI3 error code: 0x80040020 = The call is not part of a conference. TAPI3 error code: 0x80040021 = The device was removed, or the device class is not recognized. TAPI3 error code: 0x80040022 = No Assisted Telephony requests are pending. TAPI3 error code: 0x80040023 = The application is does not have OWNER privilegeon the call. TAPI3 error code: 0x80040024 = The application is not registered to handle requests. TAPI3 error code: 0x80040025 = The request queue is already full. TAPI3 error code: 0x80040026 = The call handoff failed because the specified target was not found. TAPI3 error code: 0x80040027 = No higher priority target exists for the call handoff. TAPI3 error code: 0x80040028 = The amount of user-user info exceeds the maximum permitted. TAPI3 error code: 0x80040029 = The operation cannot be completed until all TAPI applications shutdown and reinitialize. TAPI3 error code: 0x8004002a = You are not permitted to call this number. TAPI3 error code: 0x8004002b = The calling card number or other billing information was rejected. TAPI3 error code: 0x8004002c = Invalid device-specific feature. TAPI3 error code: 0x8004002d = Invalid button or lamp ID. TAPI3 error code: 0x8004002e = Invalid button state. TAPI3 error code: 0x8004002f = Invalid data segment ID. TAPI3 error code: 0x80040030 = Invalid hookswitch device ID. TAPI3 error code: 0x80040031 = The call was disconnected. TAPI3 error code: 0x80040032 = No program is available to handle the request. TAPI3 error code: 0x80040033 = The queue of call requests is full. TAPI3 error code: 0x80040034 = The called number is busy. TAPI3 error code: 0x80040035 = The called party does not answer. TAPI3 error code: 0x80040037 = The request failed for unspecified reasons. TAPI3 error code: 0x80040038 = The request was cancelled. TAPI3 error code: 0x80040039 = Invalid privilege. TAPI3 error code: 0x8004003a = The TERMINAL_DIRECTION passed in was invalid. TAPI3 error code: 0x8004003b = The Terminal passed in was invalid for this operation. TAPI3 error code: 0x8004003c = The Terminal Class is invalid. TAPI3 error code: 0x8004003d = The service provider was removed. TAPI3 error code: 0x8004003e = The maximum number of streams was reached. TAPI3 error code: 0x8004003f = The operation could not be performed because it requires terminals to be selected. TAPI3 error code: 0x80040040 = The operation could not be performed because the terminal is in use. TAPI3 error code: 0x80040041 = The operation could not be performed because it requires the stream to be stopped. TAPI3 error code: 0x80040042 = The maximum number of terminals has been reached. TAPI3 error code: 0x80040043 = The Stream passed in was invalid for this operation. TAPI3 error code: 0x80040044 = The call failed due to a timeout. TAPI3 error code: 0x80040045 = The ACD Proxy has removed this Group. Operations on this object are invalid. TAPI3 error code: 0x80040046 = The ACD Proxy has removed this Queue. Operations on this object are invalid. TAPI3 error code: 0x80040047 = The Agent object was created with CreateAgent. It does not have an ID, use CreateAgentWithID. TAPI3 error code: 0x80040048 = Invalid agent ID. TAPI3 error code: 0x80040049 = Invalid agent group. TAPI3 error code: 0x8004004a = Invalid agent password. TAPI3 error code: 0x8004004c = Invalid agent activity. TAPI3 error code: 0x8004004d = Registry Setting is Corrupt. TAPI3 error code: 0x8004004e = The peer for one of these bridge terminals has already been assigned. TAPI3 error code: 0x8004004f = The peer for this bridge terminal must be set to complete this operation. TAPI3 error code: 0x80040050 = There is no event in the MSP's event queue. TAPI3 error code: 0x80040051 = The specified address type is not supported by this address. TAPI3 error code: 0x80040052 = A resource needed to fulfill the request is not available. Toto® Tool TAPI_Error_Codes was used on an English Windows® XP (Prof., SP1) to produce the above output. For additional info on TAPI error codes see TAPI and TSPI FAQ: Q: Where are TAPI error codes defined ? Toto® Tool TAPI_ListCaps was used on an English Windows® XP (Prof., SP1) to produce the above output. There were only the default Microsoft® TSPs present with five modems installed. Obviously none of the line devices had an associated phone device. ProviderInfo          = "Windows Telephony Service Provider for Universal Modem Driver"
0x00000070:  e0 21 00 00 01 00 00 00 00 00 00 00 01 00 00 00    à! LineName              = "Bluetooth Fax Modem"
LineName              = "Bluetooth Null Modem"
LineName              = "GPRS via Bluetooth(tm)"
LineName              = "WAN Miniport (L2TP)"
0x00000070:  20 22 00 00 01 00 00 00 01 00 00 00 00 00 00 00     "
ProviderInfo          = "Microsoft Multicast Conference TAPI Service Provider"
ProviderInfo          = "Microsoft H.323 Telephony Service Provider"
Toto® Tool TAPI_GetCaps was used on an English Windows® XP (Prof., SP1) to produce the above output. There were only the default Microsoft® TSPs present with five modems installed. Obviously none of the line devices had an associated phone device. Toto TAPIex is a tool to display and change the svchost settings for tapisrv. The Value listed above should contain "...\svchost.exe -k <Value Name>"
where <Value Name> is one of the Value Names listed below. then TAPISRV is running in Shared Mode - otherwise in Exclusive Mode. Toto® Tool TAPIex was used on a German Windows® 2000 (Server, SP4) to produce the above output. Q: How can I run TAPISRV exclusively in a svchost process ? Please note that the mentioned (s. link above) optional removals are always executed by TAPIex when the mode is changed to exclusive mode. Please note also that there are write permissions to the Registry (HKEY_LOCAL_MACHINE) required to change mode. There are only read permissions are required to display the current mode. Toto consoleTapiRequestMakeCall is a tool to tapiRequestMakeCall from console. Toto® Tool consoleTapiRequestMakeCall was used on an English Windows® XP (Prof., SP2) to produce the above output. E.g. consoleTapiRequestMakeCall 555-555-5555 entered at the Console launches Microsoft® Phone Dialer like shown in the following screenshot. Toto® Tool GetIfEntry was used on an English Windows® XP (Prof., SP2) to produce the above output. le name is too long. Toto® Tool GetAdaptersInfo was used on an English Windows® XP (Prof., SP1) to produce the above output. Toto® Tool MAC_NetBIOS was used on an English Windows® XP (Prof., SP1) to produce the above output. Toto® Tool SYNCsend sends an IP/TCP packet (fixed byte sequence 0x26, 0x80, 0x01, 0x41) to a specified IP address / TCP port. There has to be a listener port active at the specified address, otherwise there will be an error reported. There is detailed error reporting on CSocket::Create() and ::Connect(). Toto® Tool WaveDevice has no command line options. 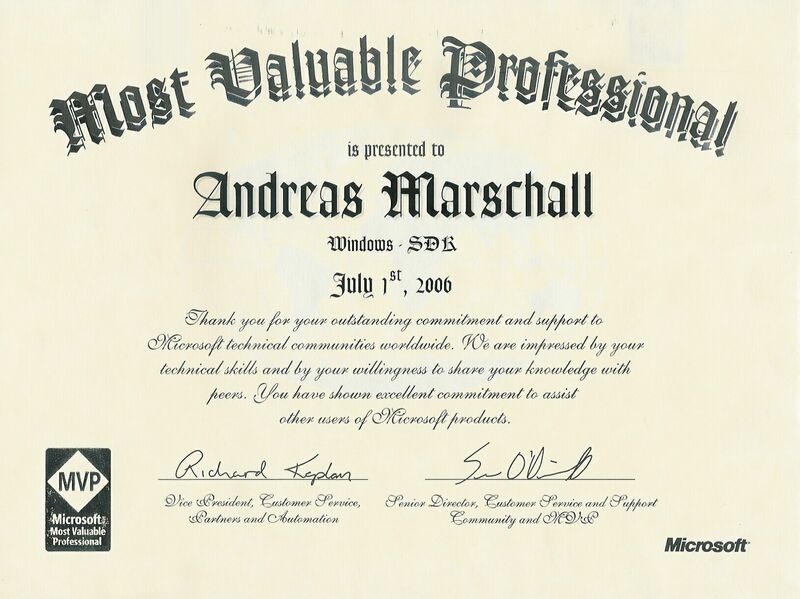 WaveDevice was used on a German Windows® 2000 (Server, SP4) to produce the above output.